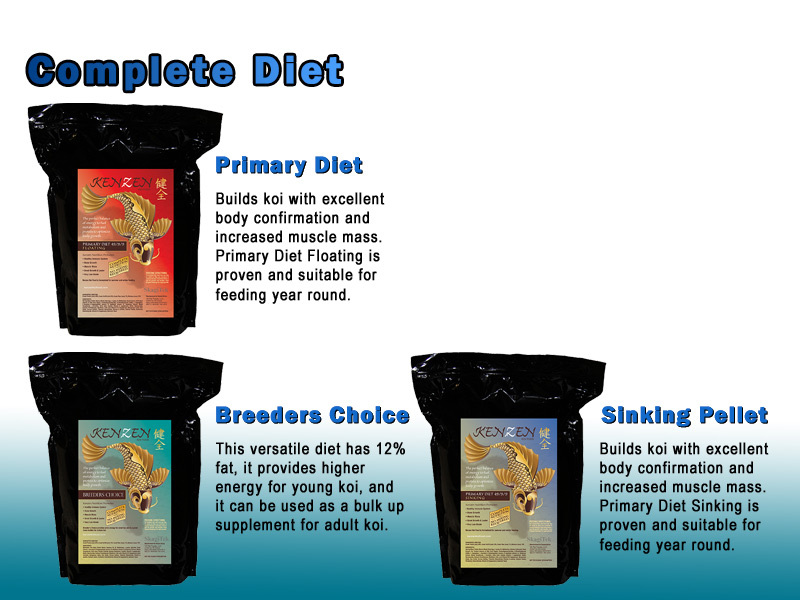 Years of research from Young Again Pet Foods has produced the perfect blend of high quality ingredients that is Kenzen Koi Food. 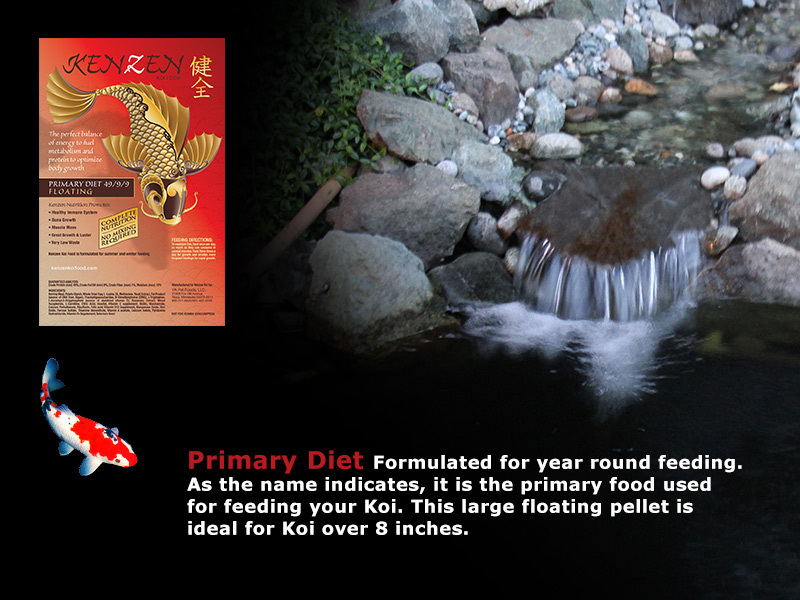 The balance of energy to fuel metabolism and protein to optimize body growth is formulated to help Koi reach their maximum potential. In the first month of feeding Kenzen Koi Food exclusively, Koi keepers notice increased muscle mass and skin luster on their Koi. 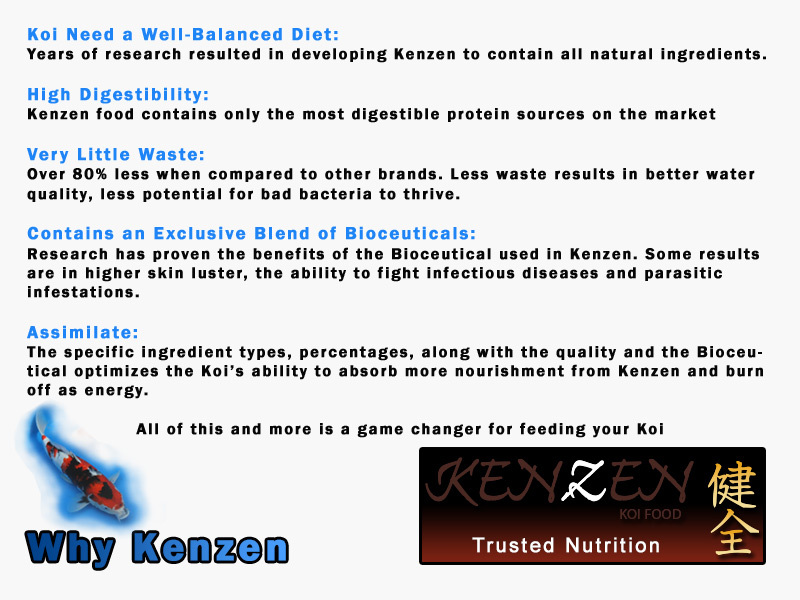 Plus, Kenzen adds an exclusive brand of Bioceuticals to help ensure the immune systems of your Koi are supplied with the materials needed to help improve their ability to fight infectious diseases and parasitic infestations. 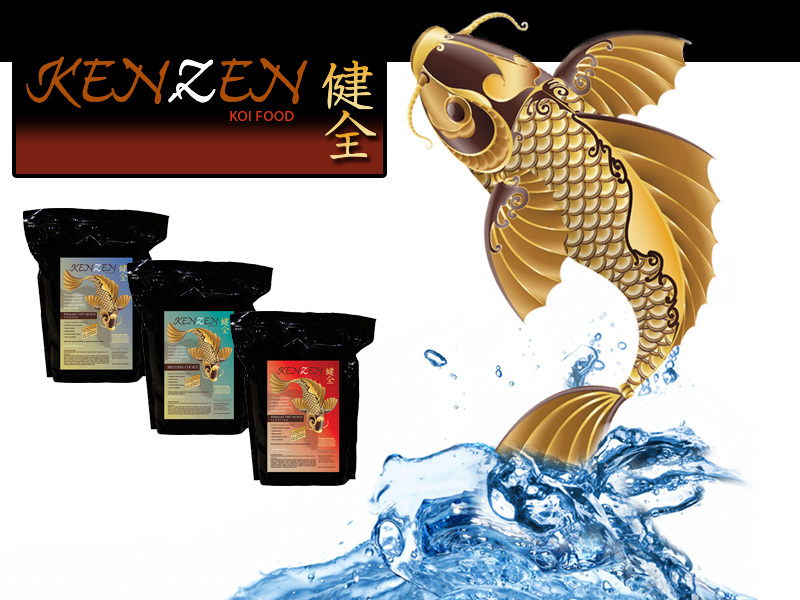 Kenzen Koi Food comes in three high quality types: Primary Diet Floating Pellet, Primary Diet Sinking Pellet, and Breeder's Choice. 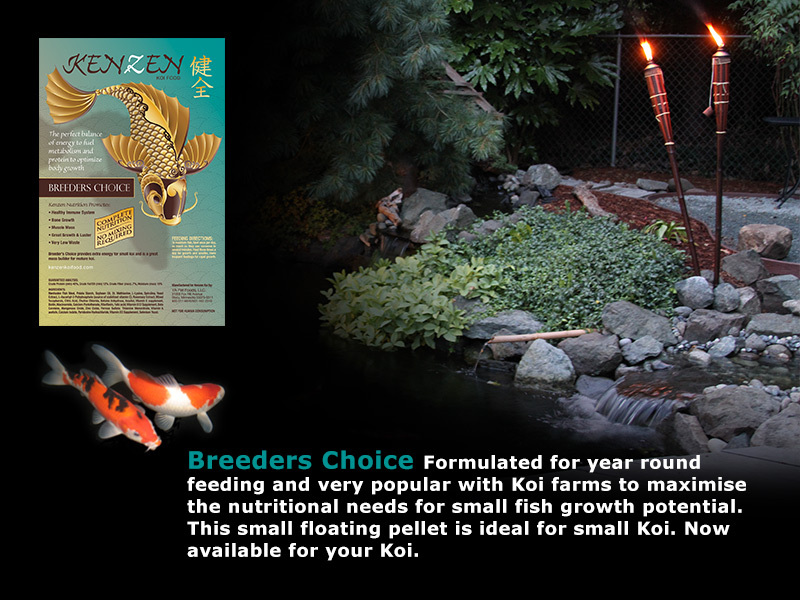 Koi can digest soluble proteins at temperatures as low as 38* F. Kenzen Koi Food was designed with only quality soluble proteins and other nutrients that are digestible even when fed in 38* water. 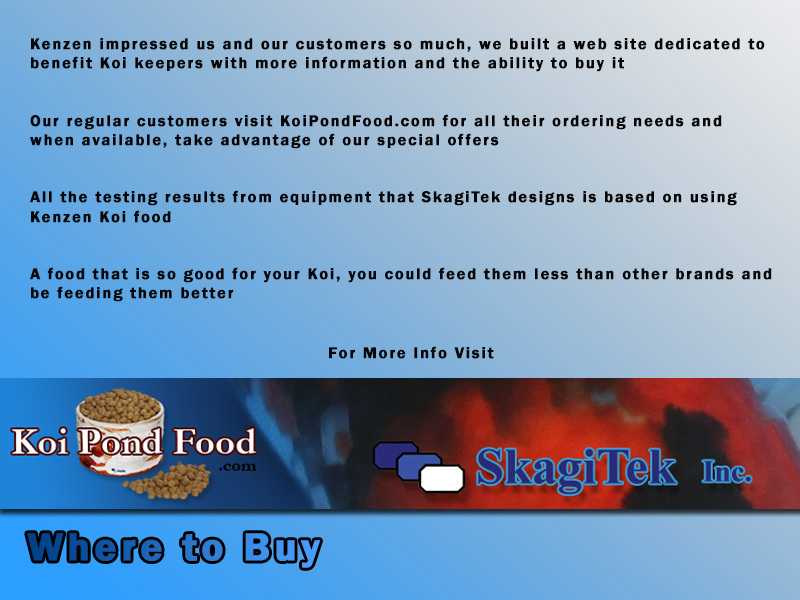 Since Kenzen Koi Food has NO fillers, you are spending your money on actual Koi food, not fillers. Resulting in more Koi food for your money. What does all this mean for your pond? It means you can use one type of food all year long. Additionally, you can see your koi fish swim to the top of the water, ready for food, even in the winter. Our testing resulted in more than an 80% "Decrease in Fish Waste" when feeding Kenzen Koi Food instead of other leading Koi food brands. 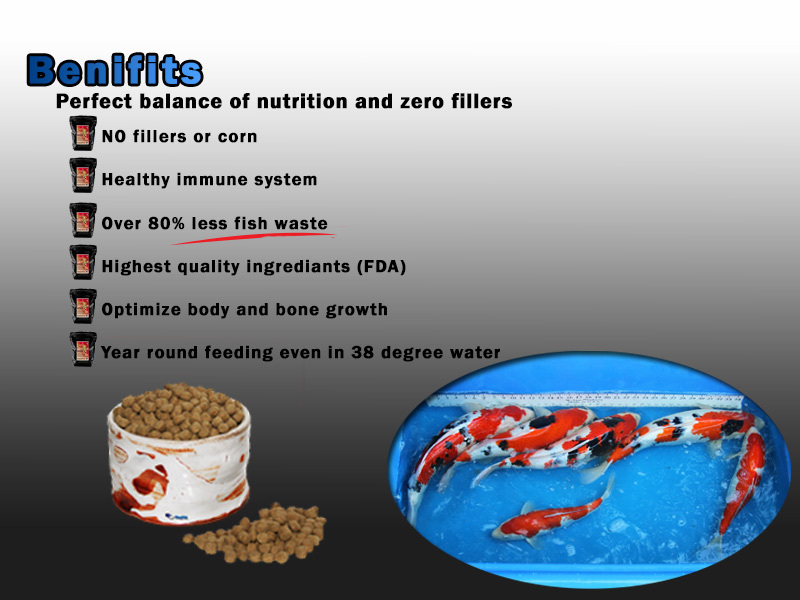 Besides less fish waste, the nutritional value from Kenzen Koi Food will make your Koi have less fat and more muscle. This means your Koi will be healthier and you won't have to backwash as often. Kenzen Koi Food uses high quality protein Herring meal. There are no: wheat, soybean meal, corn, corn gluten, alfalfa or odd ingredients from chicken farms in the formula. Only high quality proteins and carbohydrate sources are used to optimize and benefit our fish, leading to the Koi assimilating and efficiently digesting Kenzen. Herring Meal, Potato Starch, Whole Dried Egg, L-Lysine, DL Methionine, Yeast Extract, Fat Product (source of DHA from Algae), Fructooligosaccharides, N-Dimethylglycine (DMG), L-Tryptophan, L-Ascorbyl-2-Polyphosphate (source of stabilized vitamin C), Rosemary Extract, Mixed Tocopherols, L-Carnitine, Citric Acid, Inositol, Vitamin E supplement, Biotin, Niacinamide, Calcium Pantothenate, Riboflavin, Folic acid, Vitamin B12 Supplement, Manganous Oxide, Zinc Oxide, Ferrous Sulfate, Thiamine Mononitrate, Vitamin A acetate, Calcium Iodate, Pyridoxine Hydrochloride, Vitamin D3 Supplement, Selenium Yeast. We are very pleased with our large Koi developing better confirmation after feeding them Kenzen for the last few months. They are no longer fat looking and look more like they should. We live in cold climate and love that we can feed them through the Winter now! Can't do that with any other food we tested. The first improvement we saw in feeding our Koi was much brighter whites! They really love this food.